Hyperactive Ninja, developed by Ninja Coders (the same dev for Minecraft Canary), is an action packed, 2D scrolling game for Android phones. 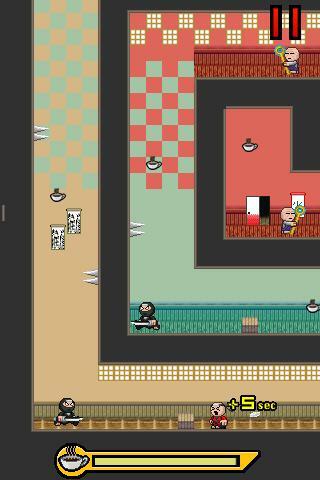 In this generally simple game, you play as a coffee-addicted ninja named Kohimaru. Your mission is simple: to retrieve the world's coffee stolen by the Evil Shogun, who plans to use the power of the caffeine to take over the world. This is certainly an interesting plot, and I must admit makes for some gameplay that is nearly as addicting as coffee. Hyperactive Ninja plays very smoothly and simply, which makes for a very easy to play game. Kohimaru, all jacked up on coffee, is constantly running. Your job is to make him jump by tapping the screen. It doesn't sound all that interesting, but with levels intricately set up with enemies, spikes, and fire, there is some strategy involved. Not only the dangers, you have a limited supply of caffeine which acts as energy. If that bar at the bottom runs out, you're finished. There is, however, a remedy for your energy going to waste. Remember all that stolen coffee you are supposed to be retrieving? Well those cups of coffee are scattered around and they also act as a small refill for your caffeine meter as well as some extra points. Your objective is to reach the door at the end of the level by wall jumping and attacking enemies from behind (and only behind!) before you run out of energy or get killed. All in all, it makes for interesting, fun gameplay. Really, all you have to do is tap the screen. It doesn't get much easier than that. The only real problem that I have with it is that the most comfortable place to tap the screen is usually right where you need to see. Other than that, there are absolutely no problems. No doubt, Hyperactive Ninja is a very fun game, but there are some times where it just gets too frustrating. Granted these times are more or less rare. Even though most good games are frustrating at some point, this one is different in that you feel like quitting instead of inflicting revenge on the level by beating it. This mostly happens with boss fights and the occasional hard level. Once you beat it, it feels too easy and unaccomplished. The only other frustrating thing is how long it takes for the beginning of each level, which replays every time you die. Mostly though, the game is very entertaining and will keep you interested for quite a while. There are a total of nine chapters to play through, featuring several enemy types and bosses. Plus, with your previous times and scores to constantly beat, achievements, and the connectedness to Scoreloop, the fun virtually never ends. For an application on the Android Market, the graphics are one of the best features of this game. The characters are cute enough and the effects are very Mario-esque. Some of the colors are kind of bland and some wooden path blocking things are hard to see, but these aren't very notable problems, and perhaps it is just my eyes. One of my favorite things in the game is the implementation of the directions and tips that are placed in the actual level. For example, on one of the early levels pasted into wall is: "You'll hate spikes soon :)". Little effects like these are something that makes the game more enjoyable and charming. By far, the sound is my favorite thing about this game. Nice, 8-Bit sound effects mixed with the extensive, 30 song, 8-Bit soundtrack that perfectly fits the frantic action of the game. There isn't a whole lot more to it other than that the sound is perfect for the game. Hyperactive Ninja is an overall a very good game with very few flaws, but flaws nonetheless. Even though there are some hiccups in the game itself, almost everything about it is flawless. For nearly one dollar, Hyperactive Ninja is worth the money no matter what kind of a gamer you are. If you are short the money, you do at least have the free trial which gives you the first four chapters (out of nine). The Ninja Coders team is proving to be very good developers and I am looking forward to some of their upcoming releases. Thanks for reading and don't forget to subscribe.